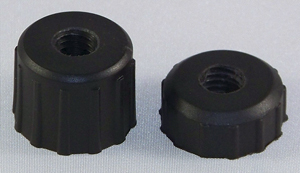 IEC's glass-filled black nylon threaded knob hubs can be used for many applications; as an adjustable height shoulder on a knob or leveler or stacked to create a sleeve to hide the threads of a leveler or knob. This will also help stabilize loads positioned near the top threads of long studs. They can also be used as a �thru-hole� knob or a locking nut.